Pulmonary Fibrosis (also known as interstitial lung disease) is a disease that can affect every part of your life. As the disease progresses, so will its impact on your life and your daily activities. The exacerbations of the disease, or period of worsening symptoms can greatly affect your quality of life. 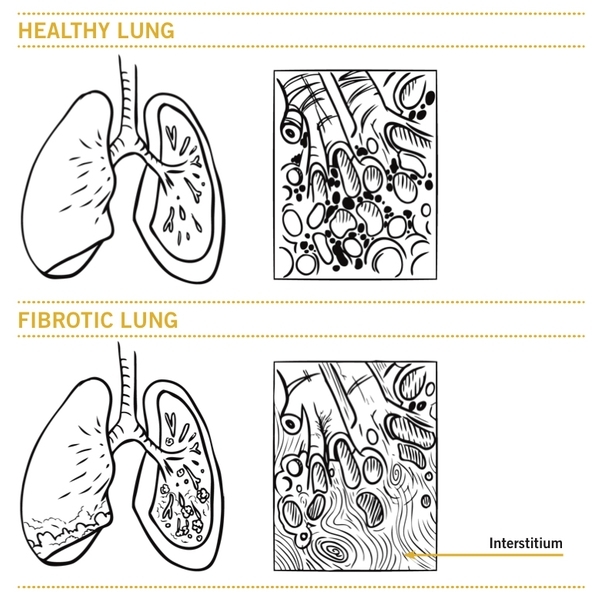 Pulmonary fibrosis is a disease characterized by progressive scaring in the lungs. Scar formation causes the lung interstitium (part of the lung where gas exchange occurs) to become thicker and stiffer. After you breathe in, oxygen needs to diffuse through the interstitium to reach the blood circulation. In pulmonary fibrosis, the thickened interstitium makes it harder for the oxygen to reach the blood circulation. How is the diagnosis of Pulmonary Fibrosis made? Diagnosing pulmonary fibrosis and identifying the precise type of fibrosis is a challenging process. This disease may be difficult to diagnose and you may need to see many doctors before knowing what type of pulmonary fibrosis you have. Many tests including pulmonary function tests, medical imagery and blood tests may be necessary to determine the type of pulmonary fibrosis you have. A diagnosis of pulmonary fibrosis can change the way you see yourself. You may feel trapped, isolated, of no use to your family and friends. You may feel hopeless. These are common reactions. But remember, you are not alone and there are many ways in which you can learn about how to regain control of your life with pulmonary fibrosis. You can discuss your concerns with your doctor or resource person. Patient support groups are a very helpful resource for gaining understanding of how to deal with the disease. Sign up for free to have access to all the learning tools of the programto help you better live with this disease.